SMS Audio has just unveiled a brand new Star Wars headphone range at CES 2015, and they look way better than the typical offerings. 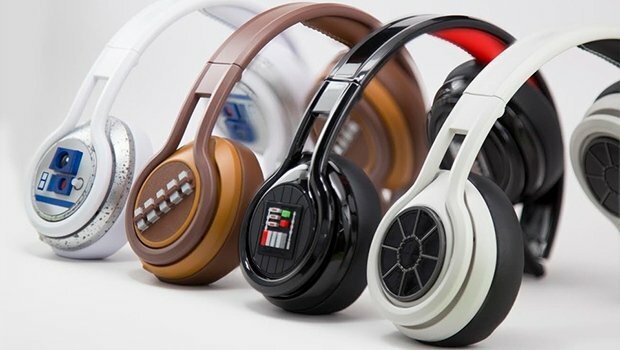 This geek-centric lineup has been called “Star Wars Street” and this is their second generation of Star Wars-inspired headphones. The four models that are coming are R2-D2, Tie Fighter, Darth Vader, and Chewbacca. Last year they offered up Stormtrooper, Rebel Alliance, Boba Fett, and Imperial designs. The R2 and Darth Vader versions look especially cool. I like the raised details. They are said to be lightweight, yet durable, with passive noise cancellation, enhanced bass, custom 40mm drivers, and leather memory foam ear cushions. And now we have just the song for you to play on them.